Gregory Lake is one of the most popular tourist attractions in Nuwara Eliya. Originally a huge swamp area, this man-made lake was constructed in 1873 under the government of Sir William Gregory and was used as a place for relaxation and recreation during the British rule. There are a number of interesting colonial buildings in the area left over from this era. Today, a plethora of activities and visitor facilities have been introduced around Gregory Lake. There’s the opportunity for walking, bike riding, and horse riding, while on the lake itself, there are a number of operators offering boat rides and various watersports activities. Those who wish to get out and enjoy the lake independently can even hire a distinctive two-seater swan boat. Access to the lake is via a park, which has a small entrance fee. Seaplanes from Colombo land on Gregory Lake, with the journey from the capital taking around 30 minutes. ‘Travel back in time’ on this full-day, British colonial-themed, private tour of Sri Lanka’s Nuwara Eliya region. Enjoy a ride aboard a vintage train into the Sri Lankan highlands, before discovering the Nuwara Eliya, a British resort area that thrived in the 19th and 20th centuries. En route back to Kandy, visit Ramboda Falls and stop at Blue Field Tea Factory. Explore the tea-growing highlands of Sri Lanka with ease on this 2-day tour from Colombo. Depart from your hotel in an air-conditioned vehicle and make your way past waterfalls to reach Nuwara Eliya. Pause for lunch at a local restaurant before heading to a tea plantation. Take a boat ride on Gregory Lake and go on a tour of Nuwara Eliya. Enjoy a beer with dinner. The next day, journey on to Kandy and visit Peradeniya Botanical Garden and the Temple of the Tooth. Experience the beauty of srilanka with your naked eyes where you will be getting a private car and professional guide for the whole tour,Stop spending more money on fools and make your trip better with ease and access with Kingfisher Tours Srilanka,Your friendly guide will greet and meet you at the Bandaranayake International Airport (CMB) or your Hotels in Colombo to start your trip. Take a deep dive into the history and culture of tea in Sri Lanka on this full-day tour to Nuwara-Eliya from Kandy. With round-trip transportation provided, there's no need to rent a car, and you can sit back and enjoy the scenic backdrop of mountains, waterfalls, and English-style cottages. Activities include stops at Ramboda falls and the Hanuman Temple Ramboda, a tour of Gregory Lake Park, and a hands-on tea-making demonstration. Get out of the city and explore Sri Lanka’s tea country on this full-day tour. Depart from your Kandy hotel in an private vehicle. Accompanied by a driver-guide, make your way into the countryside and admire the views. Stop at Ramboda Waterfall and a tea plantation and factory, and stroll past the charming bungalows and gardens of Nuwara Eliya. Rounding up inland Sri Lanka’s sights from Colombo by yourself means self-driving or hopping between trains, buses, and cabs. This private 4-days tour takes away the transport hassles: providing a private chauffeured vehicle to ferry you from sight to sight. Visit Pinnawela Orphanage, discover Kandy’s must-sees, and explore a tea plantation, Nuwara Eliya, and Sigiriya, all in one tour, Check off four Sri Lankan highlights in one private 4-days trip from Colombo Avoid public transport stresses and go in comfort by chauffeured private car Explore Kandy, Sigiriya, Pinnawela, and the tea country of Nuwara Eliya. If you want to spend your honeymoon with culture and heritage, this tour will be the perfect match to your requirement. You will enjoy some exciting honeymoon dinners in wonderful locations and explore some of the best UNESCO world heritage sites available in Sri Lanka. Book this cultural honeymoon tour and experience the best of Sri Lanka during your honeymoon. Honeymoon & Romantic Tour in Sri Lanka. Romantic getaways are the perfect way to share in new experiences and create the perfect memories that last a lifetime. Overa Tours honeymoon & romantic tour in Sri lanka provide you with the perfect locations and activities for kindling love and affection, whether you’re jetting off on your honeymoon.Romantic getaways are the perfect way to share in new experiences and create the perfect memories that last a lifetime. Overa Tours honeymoon & romantic tour in Sri lanka provide you with the perfect locations and activities for kindling love and affection, whether you’re jetting off on your honeymoon. This is a private tour suitable for travelers who visit Sri Lanka for a short period of time (for about 04days). Get an in-depth insight in to the beautiful landscapes of Sri Lanka’s hilly interior during this 3-day private tour. Visit Kandy Temple, Ramboda Waterfalls, and enjoy the sightseeing of Nuwara Eliya city which is a favorite retreat of the British during the colonial times. The town is dotted with English country style houses and half-timbered bungalows. You will also explore Horton Plains National Park, Seetha Amman Temple, Tea plantation and Factory during this tour. Crown Holidays is a family business. We are fluent in English, Arabic, Tamil and Hindi languages and passionate about sharing our country with you and we believe that we are amongst the best in the business. We’d love you to experience our country the way it really is, with people who live here and know it inside out. This makes the difference between a great holiday and a truly memorable one. Experience the private 5-night tour with your own private driver. Your itinerary covers Kitulgala water rafting, Nuwara Eliya tea plantations, tea factory, and water falls, Ella train trip and Yala National Park. Accommodation provided in different star category hotels in which you could choose. Breakfast is included in the price as well. This two days tour will give you an ultimate experience of the central hills including visits to Spice Garden which elaborate the taste of Sri Lankan cuisine, tea plantation and tea factory, Horton plain national Park which is part of the central highlands that has been declared as a UNESCO world heritage site and Nuwara Eliya city that has been famous as the "Little England". Explore Sri Lanka’s hill country and enjoy your honeymoon tour with honeymoon amenities and candlelit dinners. You will see elephants, historical temples, fascinating hill country cities, waterfalls, mountains, tea plantations and many more hill country attractions during this five-day honeymoon tour. Enjoy a remarkable tour in Sri Lanka and get an unforgettable experience of the most valuable places in the country. You will be accommodated in seven major cities and visited seven UNESCO listed world heritage sites during this seven days tour. • 7 Cities - Negombo, Dambulla, Polonnaruwa, Auradhapura,Kandy, Nuwara Eliya, Galle • 7 UNESCO Listed heritage sites - Dambulla rock cave temple, Sigiriya rock, Polonnaruwa ancient city, Anuradhapura ancient city,Kandy temple, Horton plains, Galle dutch fort. 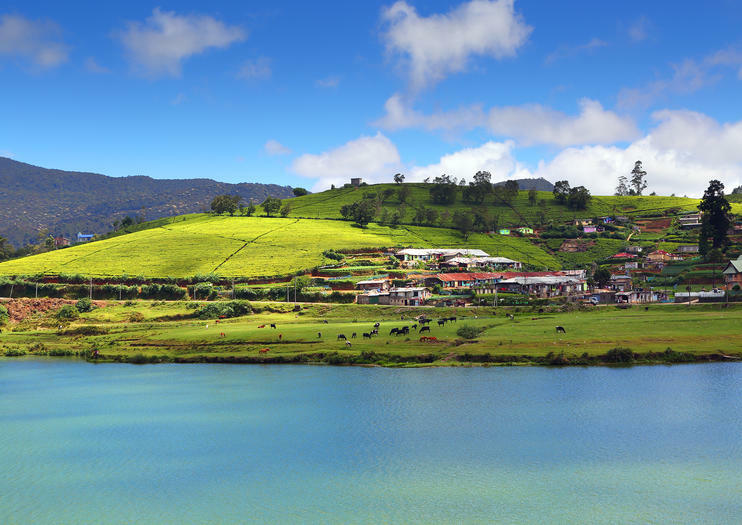 Embark on a fun-filled day tour to Nuwara Eliya, popularly known as Little England. Get to experience the tint of a British-Country-Village feeling, as you tour through the colonial era bungalow buildings, the well kept hedgerows and the beautiful gardens of Sri Lanka's City of Lights.The story of Nuwara Eliya wouldn't be complete without mentioning the fact that it is one of the best known of Sri Lanka's tea growing districts.Are you a tea lover? Then this trip is definitely for you. Tour the home of Ceylon Coffee in air-conditioned luxury cars, and fascinate yourself with it’s long rich history.